Successfully Added Siswoo A5 Smartphone - 5 Inch 540x960 Screen, Dual SIM 4G, MTK6735M Quad Core CPU, 1GB RAM, Android 5.1, Smart Wake to your Shopping Cart. You can now fly through the web with dual 4G connectivity and get all the latest toys with Android 5.1 - all on a beautiful 5 inch screen, all for under a hundred dollars. The Siswoo A5 Chocolate fits creative design, smart features and the latest OS into a friendly budget package, tied with a 64 Bit bow. While most smartphones featuring 4G connectivity tend to come with hefty price tags, with the Siswoo A5 Chocolate, you’re in luck. For under a hundred dollars, you get dual 4G connectivity – as both micro SIM cards support the network. This means, that you can set up two separate accounts on your phone, each coming with its own number, that will both benefit from the fast 4G speeds. The feature is highly useful and practical when you want to keep your personal and professional affairs separate, and offers you lots of flexibility, while staying connected. Additionally, the smartphone will give you access to dual band Wi-Fi, making sure that you fly through the web, with all the pages loading quickly and social media updates finding you in time. There are lots of perks that come with having the latest operating system. You get access to the best apps and games on the Play Store, and there is no tool or update that is out of your reach. You also be keeping up with the progress and have that comforting feeling that your phone is as modern as can be. Android 5.1 comes with lots of extras, including (but not limited to) better security (Device Protection feature), improved Priority Mode, easier volume control and a faster way to connect to Bluetooth and Wi-Fi. You will also get access to Contacts and Camera right from the corners of the locked screen, making these apps always ready for a quick start. With all the cool games and apps you are going to download, you will truly appreciate a bright 5 inch display to enjoy all that goodness on. The Siswoo A5 Chocolate comes with a classy, yet sleek and stylish look. With a large 5 inch display and a glassy back panel, it has the look and feel of a modern smartphone. The shiny back panel is not only cool-looking, but can also double as a mirror, if you need a quick look at how your hair’s doing today. Using the phone is a blast, as there is a pack of smart features to simplify its operation. You can unlock the screen with a simple double tap and enjoy a whole set of customizable smart wake functions to give yourself instant access to favourite apps. 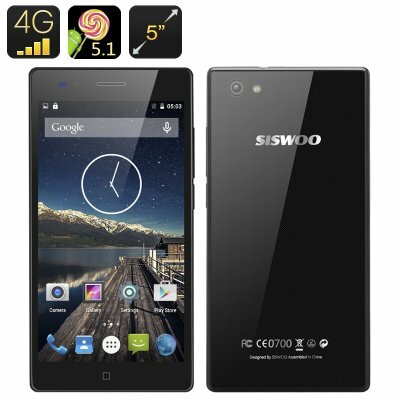 The Siswoo A5 Chocolate 4G Smartphone comes with 12 months warranty. Brought to you by the leader in electronic devices as well as wholesale Android smartphones, Chinavasion..